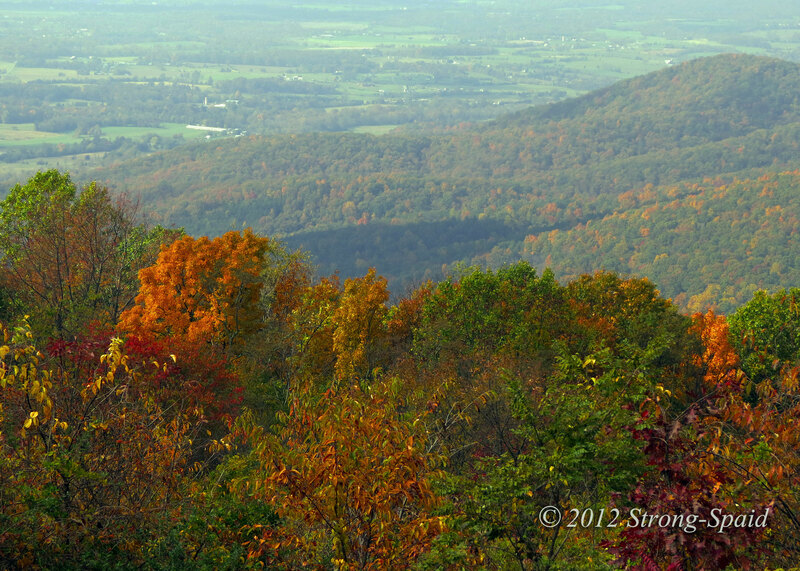 I have wanted to visit the Shenandoah National Park for quite some time and take a trip down Skyline Drive. Unfortunately, the weather started to shift on the day that I planned to go. When I listened to the morning weather report, it said the humidity in the Shenandoah mountain area was 100% (I think that is a creative way of saying it’s raining). Luckily, when I got there an hour later, the sun broke through the clouds long enough to accentuate the autumn colors of orange, yellow, and red leaves on the trees. So beautiful! I decided to stop at one of the scenic overlooks and sit on the stone wall there, so I could take in the awesome sight for a while. “Oh.” The boy’s voice sounded slightly disappointed. (Actually, knowing me, my children would have expected me to say something like that, and follow it with a story about what happens to witches who don’t practice). 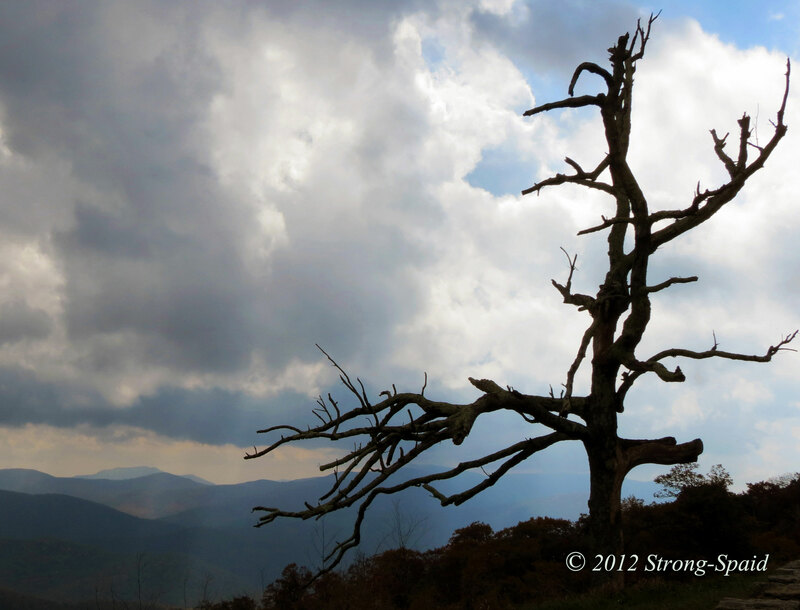 The rest of my day in Shenandoah swung back and forth between sunlight and rain, from colorful to dark and foreboding. During the times when I stood in the shadow cast by the bewitching clouds above, I was glad I had brought my raincoat. There are cabins, camping areas, hiking trails, and many other things to experience at the Shenandoah National Park. It’s not too far from my house, so I will definitely return! 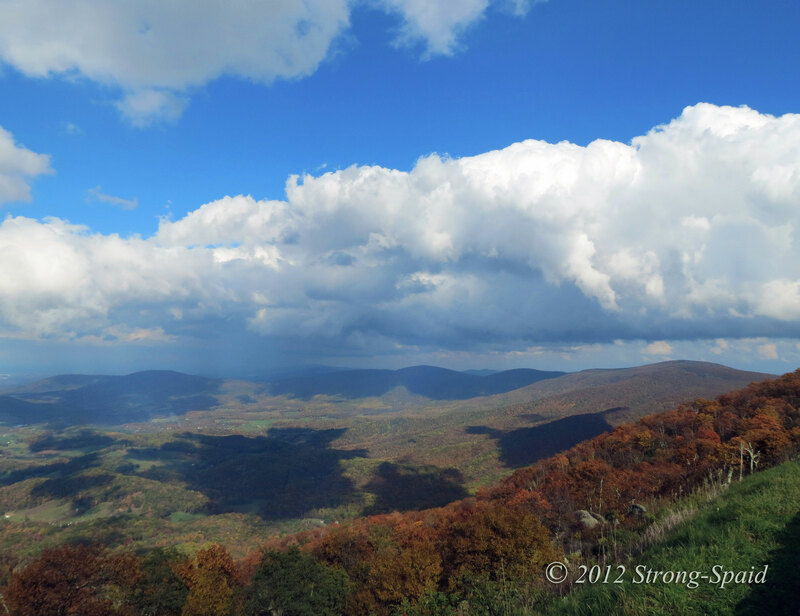 This entry was posted in Fall Colors, Nature, photography, Travel and tagged halloween, Shenandoah National Park, Skyline Drive. Bookmark the permalink. Children are so creative….They say the most interesting things! Your witch tale reminds me of a quote from one of my favorite books, The Little Prince. “All grown-ups were once children… but only few of them remember it.” Beautiful shots too. Thanks! I love the book “The Little Prince” also. My daughter read it in English, and then read it again as it was originally written (Le Petit Prince) for an assignment in a French class. Absolutely wonderful story. Southern Sea Muse…..you grew up in these mountains! I think there is a special power emanating from the mountains and the ocean, or at least that’s what I feel. I think that is why I love Hawaii so much (I lived there for 11 years). In Hawaii, you can sit on a mountain (used to be volcano) and listen to the ocean waves breathing in and out. Going back to visit there soon! You captured some beautiful scenes! Thanks for visiting my blog as well! Thanks Lisa! I enjoy looking through your impressions of nature. Love the park. love your story! Good pictures too. Thanks for sharing. The six-year-old’s mom should lose her mom-license. This made me smile. I can write BUT I am absolutely horrible at math, so it was nice to hear that the math professor struggled with writing. Oh and…Hahaha…it only took me 5 years to notice your comment! It’s 2017 now. What’s up with that? Not only am I not good at math–it appears that I don’t have a good grasp on time and space (Physics) either. I watched the shadow of the bear. I had never heard of that before. Excellent! Don’t you just hate it when unimaginative people stomp on imagination like that? Yes. The world needs imagination. A little imagination always brightens up the day. Fantastic–always stir someone’s imagination! My boyfriend and I have been wanting to go to Shenandoah. There’s a part just south of there with some of the darkest skies in the country, great for stargazing and photography of night skies. in Virginia? Or in North Carolina? Negative space (or shadows) can be more interesting than the subject sometimes. We should all pay attention to cloud shapes – will make us better photographers. And probably better philosophers! I’m envious of your proximity to such a great place. Thanks for posting some scenes. Sigh. A job would be nice, BUT…I majored in Philosophy because I love the “why” and “what if,” as much as I love taking pictures. Thanks for the compliment. I agree. The Shenandoah National Park is a great place. Nice shots Mary – I liked the story but was so saddened by the mother’s response – typical today, people are scared to let their kids use their imaginations. Thanks, Mark! I think people are sometimes unnerved by imagination because it can freely wander outside of the box (out of the norm). Love the story and the photos! 🙂 Maybe it was a witch…you never know! There is always that possibility…. such great photos, and an entertaining story to boot. thanks for sharing! H.! I must be trapped in some sort of time warp. It’s July 2017 and I just saw your response dated Dec. 9, 2012. Thank you! I see the last entry on the attached link to kbfotografix was back on December 12, 2012? I sincerely hope that you are still out there taking photos and writing…..
Like a witch’s shadow rippling by. It’s July 2017 (almost August). Amazing…Today, I just saw your response from December 2012. Well…I just learned something new! I didn’t know what a ‘Tardis’ was, so I had to look it up. Apparently it is a time machine disguised as a old police box. And TARDIS stands for Time And Relative Dimension in Space. I wish there was such a thing as a time machine. Wouldn’t it be interesting if we could travel far forward or backwards in time, any time we wanted to? But then again, maybe we would find out about some things that we really don’t want to know. Too much confusion for me, that’s for sure. These days, there seems to be a lot of people who think the grass is greener or better on the other side of the fence. A very special place Shenandoah. We used to drive down from Mass. I have lots of childhood memories sitting on the stone walls of skyline drive. I sa my first bear in the wild camping at Matthew’s arm.